cephalosporanic acid derivative cephaloglycin is poorly absorbed orally, presumably because of solvolysis of the 3-acetoxyl group in the low pH of the stomach. The resulting 3-hydroxyl derivative undergoes lactonization under acidic conditions. The 3-hydroxyl derivatives and, especially, the corresponding lactones are considerably less active in vitro than the parent cephalosporins. Generally, acyl derivatives of 7-ADCA show lower in vitro antibacterial potencies than the corresponding 7-ACA analogs. Oral activity can also be conferred in certain cephalosporins by esterification of the 3-carboxylic acid group to form acid-stable, lipophilic esters that undergo hydrolysis in the plasma. Cefuroxime axetil and cefpo-doxime proxetil are two ¡-lactamase-resistant alkox-imino-cephalosporins that are orally active ester prodrug derivatives of cefuroxime and cefpodoxime, respectively, based on this concept. Hydrolysis of the ester function, catalyzed by hepatic and renal esterases, is responsible for some in vivo inactivation of parenteral cephalosporins containing a 3-acetoxymethyl substituent (e.g., cephalothin, cephapirin, and cefotaxime). The extent of such inactivation (20%-35%) is not large enough to seriously compromise the in vivo effectiveness of acetoxyl cephalosporins. Parenteral cephalosporins lacking a hydrolyzable group at the 3-position are not subject to hydrolysis by esterases. Cephradine is the only cephalosporin that is used both orally and parenterally. The cephalosporins are considered broad-spectrum antibiotics with patterns of antibacterial effectiveness comparable to that of ampicillin. Several significant differences exist, however. Cephalosporins are much more resistant to inactivation by ¡-lactamases, particularly those produced by Grampositive bacteria, than is ampicillin. Ampicillin, however, is generally more active against non-6-lactamase-producing strains of Gram-positive and Gram-negative bacteria sensitive to both it and the cephalosporins. Cephalosporins, among ¡-lactam antibiotics, exhibit uniquely potent activity against most species of Klebsiella. Differential potencies of cephalosporins, compared with penicillins, against different species of bacteria have been attributed to several variable characteristics of individual bacterial species and strains, the most important of which probably are (a) resistance to inactivation by ¡-lactamases, (b) permeability of bacterial cells, and (c) intrinsic activity against bacterial enzymes involved in cell wall synthesis and cross-linking. The susceptibility of cephalosporins to various lactamases varies considerably with the source and properties of these enzymes. Cephalosporins are significantly less sensitive than all but the ¡-lactamase-resistant penicillins to hydrolysis by the enzymes from S. aureus and Bacillus subtilis. The "penicillinase" resistance of cephalosporins appears to be a property of the bicyclic cephem ring system rather than of the acyl group. Despite natural resistance to staphylococcal ¡-lactamase, the different cephalosporins exhibit considerable variation in rates of hydrolysis by the enzyme.77 Thus, of several cephalosporins tested in vitro, cephalothin and cefoxitin are the most resistant, and cephaloridine and cefa-zolin are the least resistant. The same acyl functionalities that impart ¡-lactamase resistance in the penicillins unfortunately render cephalosporins virtually inactive against S. aureus and other Gram-positive bacteria. 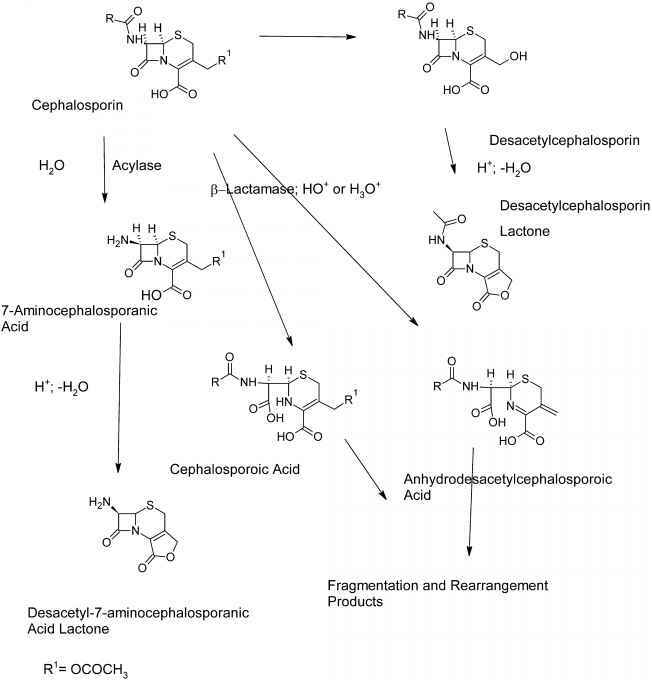 Figure 8.5 • Degradation of cephalosporins. S-Lactamases elaborated by Gram-negative bacteria present an exceedingly complex picture. Well over 100 different enzymes from various species of Gram-negative bacilli have been identified and characterized,25 differing widely in specificity for various jS-lactam antibiotics. Most of these enzymes hydrolyze penicillin G and ampicillin faster than the cephalosporins. Some inducible jS-lactamases belonging to group C, however, are "cephalosporinases," which hydrolyze cephalosporins more rapidly. Inactivation by jS-lactamases is an important factor in determining resistance to cephalosporins in many strains of Gram-negative bacilli. The introduction of polar substituents in the aminoacyl moiety of cephalosporins appears to confer stability to some jS-lactamases.78 Thus, cefamandole and cefonicid, which contain an a-hydroxyphenylacetyl (or mandoyl) group, and ceforanide, which has an tf-aminophenyl acetyl group, are resistant to a few ^-lactamases. Steric factors also may be important because cefoperazone, an acylureidocephalosporin that contains the same 4-ethyl-2,3-dioxo-1-piperazinylcar-bonyl group present in piperacillin, is resistant to many fS-lactamases. Oddly enough, piperacillin is hydrolyzed by most of these enzymes. Two structural features confer broadly based resistance to S-lactamases among the cephalosporins: (a) an alkox-imino function in the aminoacyl group and (b) a methoxyl substituent at the 7-position of the cephem nucleus having a stereochemistry. The structures of several jS-lactamase-resistant cephalosporins, including cefuroxime, cefotaxime, ceftizoxime, and ceftriaxone, feature a methoximino acyl group. jS-Lactamase resistance is enhanced modestly if the oximino substituent also features a polar function, as in ceftazidime, which has a 2-methylpropionic acid substituent on the oximino group. Both steric and electronic properties of the alkoximino group may contribute to the jS-lactamase resistance conferred by this functionality since syn-isomers are more potent than anti-isomers.78 jS-Lactamase-resistant 7a-methoxyCephalosporins, also called cephamycins because they are derived from cephamycin C (an antibiotic isolated from Streptomyces), are represented by cefoxitin, cefotetan, cefmetazole, and the 1-oxocephalosporin mox-alactam, which is prepared by total synthesis. Base- or S-lactamase-catalyzed hydrolysis of cephalosporins containing a good leaving group at the 3-position is accompanied by elimination of the leaving group. 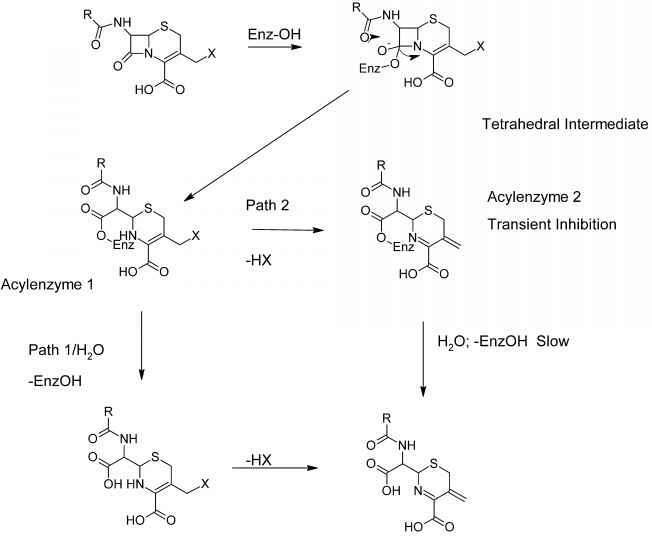 The enzymatic process occurs in a stepwise fashion, beginning with the formation of a tetrahedral transition state, which quickly collapses into an acyl-enzyme intermediate (Fig. 8.6). 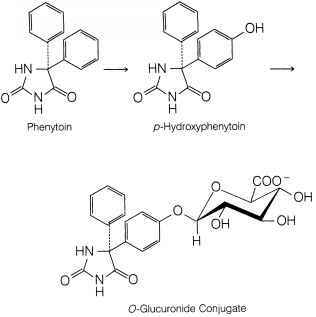 This intermediate can then either undergo hydrolysis to free the enzyme (path 1) or suffer elimination of the leaving group to form a relatively stable acyl-enzyme with a conjugated imine structure (path 2). Because of the stability of the acyl-enzyme intermediate, path 2 leads to transient inhibition of the enzyme. Faraci and Pratt79,79a have shown that cephalothin and cefoxitin inhibit certain S-lactamases by this mechanism, whereas analogs lacking a 3' leaving group do not. Species of Pseudomonas, especially P. aeruginosa, represent a special public health problem because of their ubiquity in the environment and their propensity to develop resistance to antibiotics, including the jS-lactams. The primary mechanisms of S-lactam resistance appear to involve destruction of the antibiotics by jS-lactamases and/or interference with their penetration through the cell envelope. Apparently, not all jS-lactamase-resistant cephalosporins penetrate the cell envelope of P. aeruginosa, as only cefop-erazone, moxalactam, cefotaxime, ceftizoxime, ceftriaxone, and ceftazidime have useful antipseudomonal activity. Two cephalosporins, moxalactam and cefoperazone, contain the same polar functionalities (e.g., carboxy and N-acylureido) that facilitate penetration into Pseudomonas spp. by the penicillins (see carbenicillin, ticarcillin, and piperacillin). Unfortunately, strains of P. aeruginosa resistant to cefoper-azone and cefotaxime have been found in clinical isolates. Figure 8.6 • Inhibition of j-lactamases by cephalosporins. What functional group in cephalosporin confers acid stability?